Part I describes Heilbronn and the environment from which Cluss came, his route into the revolutionary politics of Germany in 1848, and his emigration to the United States, where he established himself in German-American life and in the professional and intellectual milieu of the U.S. capital. Part II reviews the urban planning, public works, and architectural issues to which Cluss devoted himself from the late 1860s through the early 1890s. It examines in detail forms of public architecture for which Cluss earned recognition as an innovator, especially museums, schools, and public markets. Many previously unpublished illustrations support the essays. A family album illustrates Cluss's German and American families, and a photo essay illustrates Washington in Cluss's time, Cluss's contribution to Washington, and the fate of Cluss's buildings and city. On May 20, 2006, the Victorian Society of America presented the 2006 Henry Russell Hitchcock Award to this book. Christof Mauch and Cynthia Field (Smithsonian Institution) accepted the award on behalf of the entire Cluss Team. The presentation was part of the Society's 40th annual meeting, held in St. Louis, Missouri. The award reads, “For its international collaboration as well as its introduction of an important architect to the national canon, this book should serve as a model for future scholarship in the field of architecture in the United States.“ - Ingrid Steffen, Book Awards Committee. 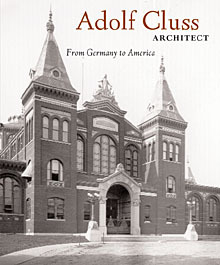 Adolf Cluss, Architect: From Germany to America. Jointly published in English and German versions by the Historical Society of Washington, D.C. and the Stadtarchiv Heilbronn. Distributed by Berghahn Books (English) (www.berghahnbooks.com) and the Stadtarchiv Heilbronn (German) (www.stadtarchiv-heilbronn.de). A Bergamot Book.